It has always struck me as one of Ireland’s great tragedies, that many of our kin have died in the service of foreign armies. While in the nineteenth and twentieth centuries this predominantly meant the service of Britain or the United States, in earlier centuries Irishmen served much more diverse causes. The day seemed virtually lost, and King Louis was about to leave the field. In this juncture, Saxe ordered up his last reserve–the Irish Brigade. It consisted that day of the regiments of Clare, Lally, Dillon, Berwick, Roth, and Buckley, with Fitzjames’ horse. O’Brien, Lord Clare, was in command. Aided by the French regiments of Normandy and Vaisseany, they were ordered to charge upon the flank of the English with fixed bayonets without firing. Upon the approach of this splendid body of men, the English were halted on the slope of a hill, and up that slope the brigade rushed rapidly and in fine order; the stimulating cry of ‘Cuimhnigidh ar Liumneac, agus ar fheile na Sacsanach,’ ‘Remember Limerick and British faith,’ being re-echoed from man to man. The fortune of the field was no longer doubtful. The English were weary with a long day’s fighting, cut up by cannon, charge, and musketry, and dispirited by the appearance of the Brigade. Still they gave their fire well and fatally; but they were literally stunned by the shout, and shattered by the Irish charge. They broke before the Irish bayonets, and tumbled down the far side of the hill disorganized, hopeless, and falling by hundreds. The victory was bloody and complete. Louis is said to have ridden down to the Irish bivouac, and personally thanked them; and George the Second, on hearing it, uttered that memorable imprecation on the penal code, ‘Cursed be the laws which deprive me of such subjects.’ The one English volley and the short struggle on the crest of the hill cost the Irish dear. 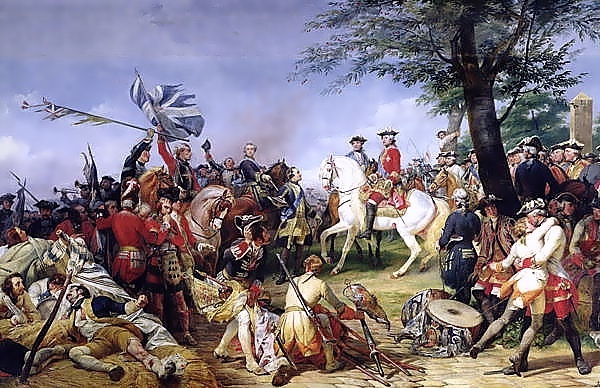 One-fourth of the officers, including Colonel Dillon, were killed, and one-third of the men. Some might paint this victory, as Sullivan does, as some kind of English/Irish conflict. The truth, as with so many of these engagements when Irish blood was shed and English with it, was and remains that Irishmen were pawns in a much bigger game. In this case French European imperial ambitions. Fontenoy helped bring much of that ambition to fruition in the short terms but built up resentment and resistance that led to defeat on further flung shores over the course of the next half century all the while building a maintain of debt that precipitated the crisis in royal finances that put in motion the forces of revolution, anarchy and nationalism that was the French Revolution. Written by: Eoinpurcell on 11 May, 2010.on 23 June, 2010. 3 Responses to "Today In Irish History – The Battle Of Fontenoy, 11 May"
See Venture and Venus by Michael Mc Donough holder of the UN Congo Peace Medal(isbm 978-0-9546655-1-7). a novel in which the spirit of Fontenoy is relived by an Irish UN Battalion in Katanga. The Battalion share their feelings, linked to Fontenoy, with members of the Madras and Rajputana Rifles. Before the battle Mc Donough from Liscannor broke the sword arm of an English officer in single arm combat. His feat raised the spirits of the Irish. Details of Mc Donough’s feat on his gravestone in Liscannor graveyard.